Peel, core and chop apples and place them in a blender. 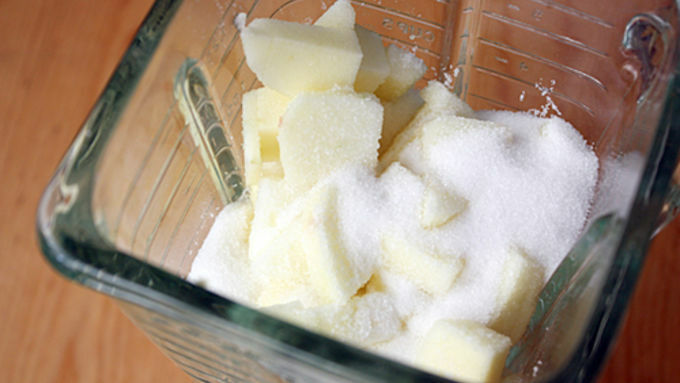 Add grated ginger, sugar and lemon juice. Blend into a puree. Pour the puree into a medium saucepan over medium-high heat. Bring just to a simmer, then reduce heat to medium-low. Continue stirring occasionally, then more often, until mixture is very thick and has lost most of its moisture, about 35 to 40 minutes. NOTE: Mixture may splatter if you don't stir often enough, so don't walk away from the stove. Remove saucepan from heat and set aside. Preheat oven to 200°F. Line a 13-by-17-inch baking sheet with a silicone mat or parchment paper and spray with cooking spray or brush with vegetable oil. 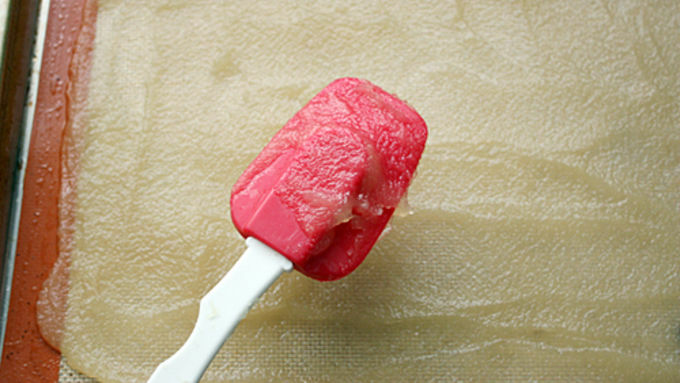 Pour mixture onto prepared sheet and, using a spatula, carefully smooth out into a very thin, very even layer. Place sheet in oven and bake until mixture is firm and barely tacky (but not crunchy), about 3 to 3 1/2 hours. Remove from oven and allow leather to cool completely. Peel off very carefully and place, smooth-side down, on a sheet of wax paper. 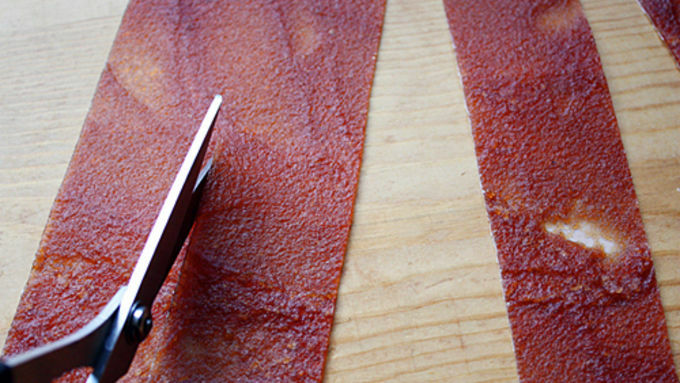 Use scissors to cut the leather into strips of desired width (recipe makes up to 16). 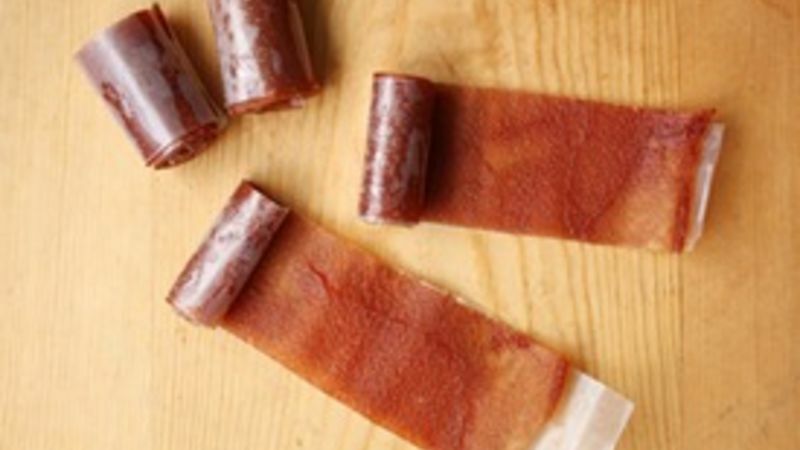 Roll up strips and store in an airtight container at room temperature for up to 9 days. If there’s a shortcut or a more convenient route when it comes to recipes, I’m all for it. But if I’ve got the time and I’m in the mood for making something homemade – even if it’s readily available at the grocery store – I’ll do that, too, especially if it renders flavors I can’t necessarily find anywhere else. 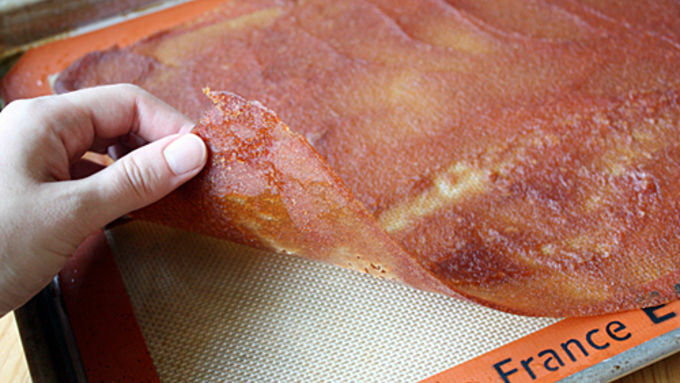 This Apple-Ginger Fruit Leather is one example. While I have absolutely loved Fruit Roll-Ups ever since I could wield a backpack and a lunchbox, there is something about making my own version from scratch every once in a while that’s fun for me. And I can make crazy flavors, like apple-ginger or strawberry-lime or blueberry-banana. Consider it the “fruits” of my labor, if you will – things that take extra preparation just taste better sometimes. Sure, it’s a bit time-consuming, but most of that time can be spent playing Scrabble or taking a nap or having a staring contest with your cat. And whatever active time there is in the recipe is spent mostly whirring a blender, staring at a stovetop and using a spatula to spread out the leather very, very thin. Here’s how you do it: Voila! 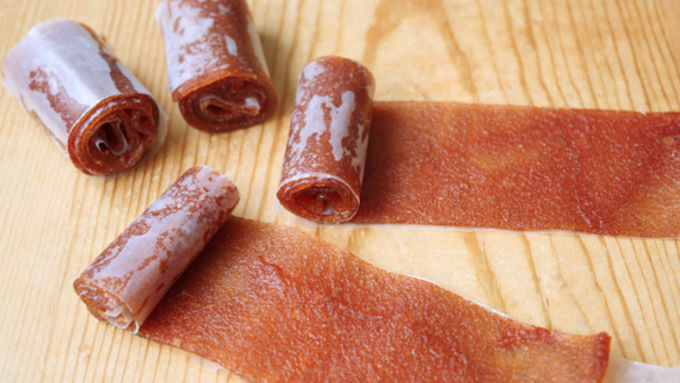 Homemade fruit leather. Now go enjoy while you finish the staring contest with your cat.